Every year the president pardons a lucky turkey for Thanksgiving. Well, as sea ice disappears and the climate tanks, we think it's about time the president extended that courtesy to polar bears. That's why the Center's own Frostpaw the Polar Bear is making a special pilgrimage to Washington D.C. next week. 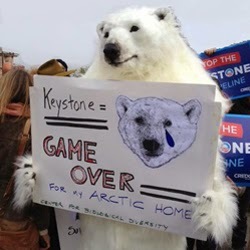 Starting Nov. 18, Frostpaw will be camped out in front of the White House every day till Thanksgiving delivering an urgent and unmistakable message: Reject Keystone XL and phase out all the deadly fossil fuel projects driving polar bears -- and the rest of us -- into hot water. But we need you to help us "Pardon the Polar Bears." Please take action now to tell Obama to pardon the polar bear and reject Keystone XL this Thanksgiving. Then, if you'll be in Washington, D.C. between Nov. 18 and 28, please contact the Center's No Keystone campaigner, Valerie Love, to help out. We hope you can join us -- you may even get the opportunity to play Frostpaw yourself.